Officially called the Nova Scotia House of Assembly, the Province House is where they would meet every year since 1819 and is now the oldest house of government in the nation, rising up three stories, this outstanding example of Palladian architecture is believed to be the finest in all North America. In 1848, it would be the site for the first form of responsible government in the British Empire, outside the UK, situated in downtown Halifax, and one of the smallest functioning legislatures in North America. It had originally housed the judicial, executive and legislative functions of the colony, in just one building. Its Red Chamber was where the Legislative Council met, being the upper house of the province's legislature, appointed by the governor, but abolished in 1928. 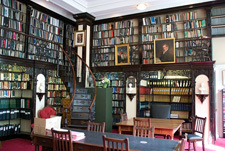 The legislative assembly is the home of the House of Assembly, the province's elected legislature, while the legislative library is located on the second floor, and had been the original home of the Supreme Court of Nova Scotia, until the court would outgrow the spaces. This chamber had been the site of Joseph Howe's 1835 trial for seditious libel. Citadel Hill is a magnificent glacial drumlin situated on the Halifax Peninsula, with a spectacular view of the entrance to the harbor, McNabs Island and George's Island. The British would found Halifax in 1749 to stop a growing French presence at Fortress Louisbourg, some 80 miles northeast. The town's site would be picked in part since the drumlin was able to provide protection for the navy dockyard, with four different defensive installations occupying the hilltop location since that period, with the building and leveling resulting in the summit losing some eight to ten feet in height. 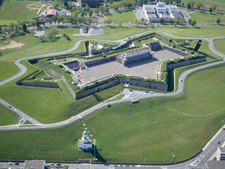 Citadel Hill and the harbor defense fortifications gave the Royal Navy the most secure and strategic fort in eastern North America, from its Halifax dockyard that commanded the Great Circle Route to western Europe, thus giving the city the nickname of "Warden of the North". The large British presence in Halifax would be concentrated through Citadel Hill and the Royal Navy's dockyard is believed to be the main reason that the province of Nova Scotia would become the fourteenth colony after Britain won the Seven Years' War, and it would remain loyal to the Crown during and after the American Revolution. The first fort would become the western perimeter wall for the old city that was protected by no less than five forts. Citadel Hill had a three story octagonal blockhouse from 1776 until 1789, covering a fourteen gun battery. The fortress located there now is a star shaped citadel and officially called Fort George, finished in 1856 after 28 years of construction. The huge masonry designed fort could repel a land-based attack by the US and inspired by the designs of Louis XIV's commissary of fortifications Sebastien Le Prestre, Seigneur de Vauban, a star shaped hillock fortress with internal courtyard and excellent view of the harbor from their armoured ramparts. Sometime between 1820 and 1831, the British would construct a similar but bigger citadel in Quebec City that is now the Citadel of Quebec.